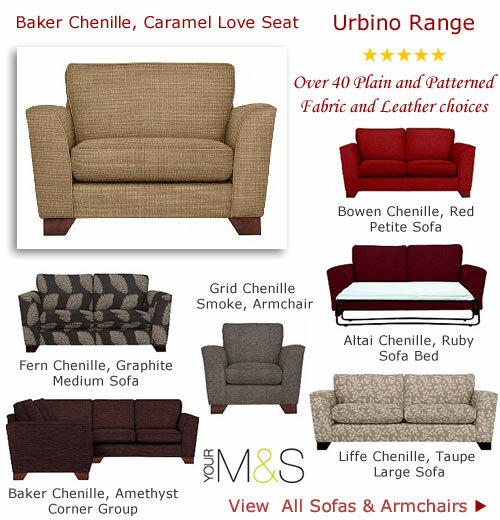 Create a warm welcoming vibe in your living room with rich textured sofas and armchairs from the M&S furniture range. High quality fabrics and leather loveseats, armchairs and sofas will transform every interior with classic to contemporary, compact to super spacious there’s something to suit all size rooms. Choose a design best suited for the allotted area and one that will work with existing pieces. For a complete design change to a room the Urbino range offers simple clean lines combined with a comfortable shape. The Urbino range has shape-retaining foam seat cushions with the fabric options having reversible cushions. Modern shaped feet are solid birch with a dark finish. The petite sofa is another compact design for small spaces that looks good along side the matching loveseat. Keep the same colour and fabric choice or add a little drama by choosing a vibrant stripe or pattern. Take you pick from big to small armchairs and sofas and make the most of your living space. Well made roomy and comfortable seating for everyone with over 40 colour fabric choices makes the Urbino one for the short list when redesigning your home. The range includes a medium sofa bed, corner group, standard armchair, petite, medium, and large sofas plus love seats. Discover the latest home trends and shop glamorous home essentials to make each room complete. Marks and Spencer stylish room ideas and sofa buying guides take you through step by step on how to revamp your home with helpful tips on how to make the most of your space. Browse by room for instant home inspiration.